It's demolition time for 334 and 336 22nd Street. The two frame buildings sold last year for $1.9 & $1.5M respectively, to an LLC with a Long Island address. As yet, there are no permits filed for a new building. 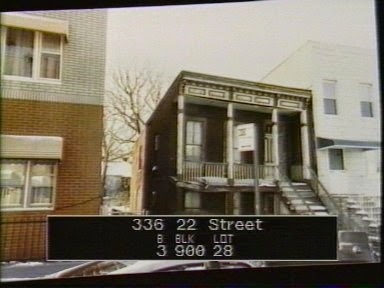 A look at the 80's tax photos shows 334 looking pretty much unchanged from thirty years ago, but 336 is revealed as an old sweetheart of a building. You could always bet that the cover-up job in more recent years had kept a lot of its details under wraps. In 1886, the house was sold at auction for unpaid taxes, for the sum of $125.